It has been a decade since my work with the propagation and study of a drab looking unknown bore of a coral. From what started as an interesting idea is now a full blown fairytale known as the Blundell Buttons. As a young scientist I had a fascination with the marine ornamental hobby, and its role in the industry. I proposed a project one day to my fellow researchers and advisors. The plan was to track and document the collection, importation, and husbandry, and culture of a specific coral. We thought it could be an early attempt (if not the first) to track the coral over time. The overall goal was to show the potential for captive aquaculture. That was about it. We found what seemed to be a perfect fit. We found a coral that was easily identifiable, rarely if ever seen in the hobby (at least in our location), easy to propagate, and not something we would expect to see in large numbers down the road. Well we didn’t know for sure. At the time there was debate over the classification of the coral. The common identification book at the time was Reef Coral Identification by Humann (Humann 1993). This book did not list the coral, and rightfully so as the scientific community often sees corals as only being scleratinians, corals building skeletons. Humann did have this coral listed in his invertebrate book Reef Creature Identification (Humann 1992) and listed the coral as Palythoa grandis. Shortly following the onset of our project Julian Sprung wrote his wonderful book Corals a Quick Reference Guide (Sprung 1999). However, this book did not include the coral in question. A couple years later Eric Borneman wrote his masterpiece Corals (Borneman 2001) and this book listed the coral as Protopalythoa grandis. I asked Eric about this in person a few years ago and his answer was something like ‘I’m still not sure if that is correct’ (Blundell 2006). With such debate still taking place you can see how difficult it would have been to identify this coral years ago. Shown here is the location of the original collection site. With a current debate on the naming of such coral in place, the University I was attending had trouble acquiring the export/import/collection permits. The original paperwork came back to me and have approval for this unknown coral which the government had labeled as “Blundell Polyps” on some forms and as “Palythoa Blundell” on another. I guess it was easiest for them to just put my name on the permit with the coral since I would be the person clearing them through customs (both away and US). Little did I know what role that would play in later years. 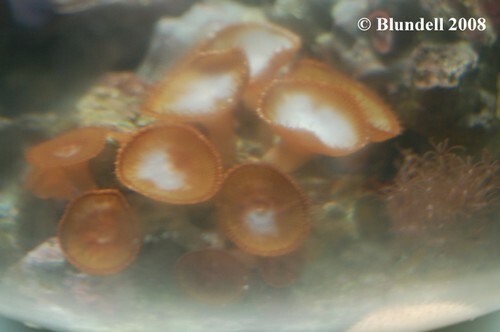 For several months these were termed Blundell coral or Blundell Polyps and the like until a hobbyist named Steve Lopez stated that he was calling them Blundell Buttons. And so the name was given. 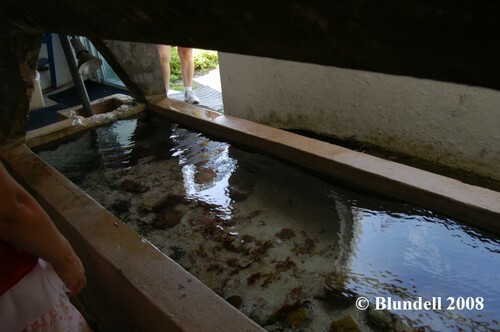 Here the laboratory aquarium is shown where the coral was held prior to being propagated. So the project began. We had our coral and we were ready to use it. We were going to propagate this coral and track it through the hobby. Here is how we did it. I then took the original colony and held it in my hand. I had to decide what to do with this ever important rock. I knew I couldn’t keep it. I can’t imagine how bad I’d feel if it died in my care. So I thought of all the tanks out there, and all the great reef systems. I tried to think of the best possible aquarium. I thought of where this coral would have the best chance of surviving for all time and eternity. And that is where I put the coral. That was the plan. Now, how well did it work? The results will be in the next article.